I was extremely busy last week with work writing—you know, the kind I actually get paid for—so I missed some significant news from one of my favorite U.S. brewers: Dogfish Head announced a brand new “core” beer called Sixty-One, which will be available in four packs starting in March. And it’s the first new core beer, meaning it will be available year round, from Dogfish since 2007. Sixty-One is a blend of Dogfish’s most popular beer, its 60 Minute IPA, and syrah grape must from California. Dogfish’s founder Sam Calagione has apparently been mixing red wine and IPA for years, and he enjoyed the product so much that he decided to bottle it. Dogfish has certainly been busy in recent days. Last month it announced its A Hop Eclipse Now promotion, as part of which Dogfish will release a new signature beer glass and two new IPAs. It released a brand new Ancient Ale. Dogfish is collaborating with the Grateful Dead to make its American Beauty ale. And its latest Life & Limb collaboration with Sierra Nevada, Rhizing Bines, is expected to release later this month. 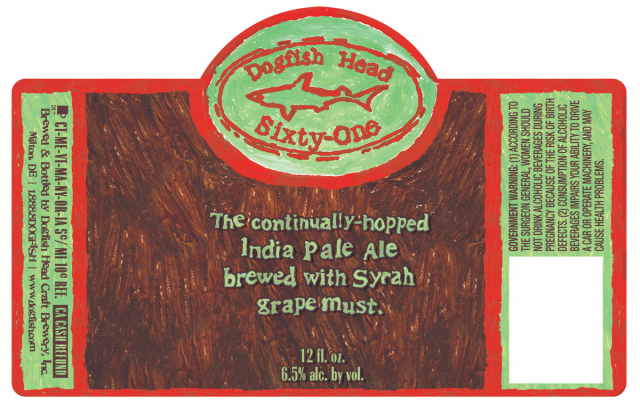 Read more about Dogfish Head’s new Sixty-One IPA syrah-grape concoction on the brewer’s website.